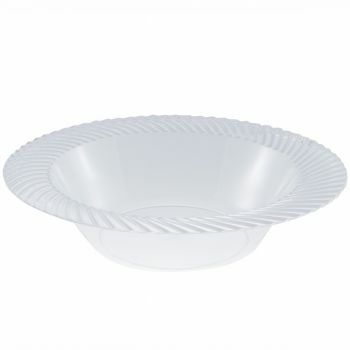 Product: 340ml/12oz Clear Strong Disposable Plastic Bowls with Swirl Design – Pack of 10 was added to cart. A great choice for parties, celebrations, and family gettogethers, Mashers Clear Plastic Swirl Design Disposable Soup Bowls will make a stunning addition to any table, buffet of gourmet banquet. Made from strong plastic with a high crack-resistance, these premium quality disposable bowls are suitable for serving both hot and cold foods, and so they are perfect for soups, salads, desserts and finger foods such as crisps and snacks. Finished in clear with a stylish swirl design, they exuded elegance. Coordinating disposable side plates, dinner plates, and dessert bowls available in the Mashers Swirl Collection.